Isometric drawing of the Square1 drawing device. Square1 (sometimes also spelled “Square One”) is a collection of single-task dedicated learning devices designed for collaborative work at school. The collection consists of three devices: (1) one for writing, (2) one for drawing, and (3) one central computer device for online and offline search and assembling presentations out of the content created by students. While the writing and drawing devices are dedicated for precisely these tasks, they can also be connected to the central device for students to share content. The writing device will include a screen, a keyboard, a scrolling wheel and a share button. There will be no files, but students will share paragraphs that may be named. The screen is infinite and individual paragraphs cannot be deleted. The device may be restored to delete all previous content. If a student would like to save their paragraphs, the writing device can be connected to the central device, move over their paragraphs and store them in the cloud. Illustration of five connected Square1 devices. The drawing device will include a pliable touch screen, which, similar to paper, gives in to touch. The device will afford paper like drawing capabilities such as texture tracing. Similarly to the writing device, the screen expands infinitely to all sides, orientation is facilitated through graphic navigation support, and pictures can be saved by moving them to the central device. 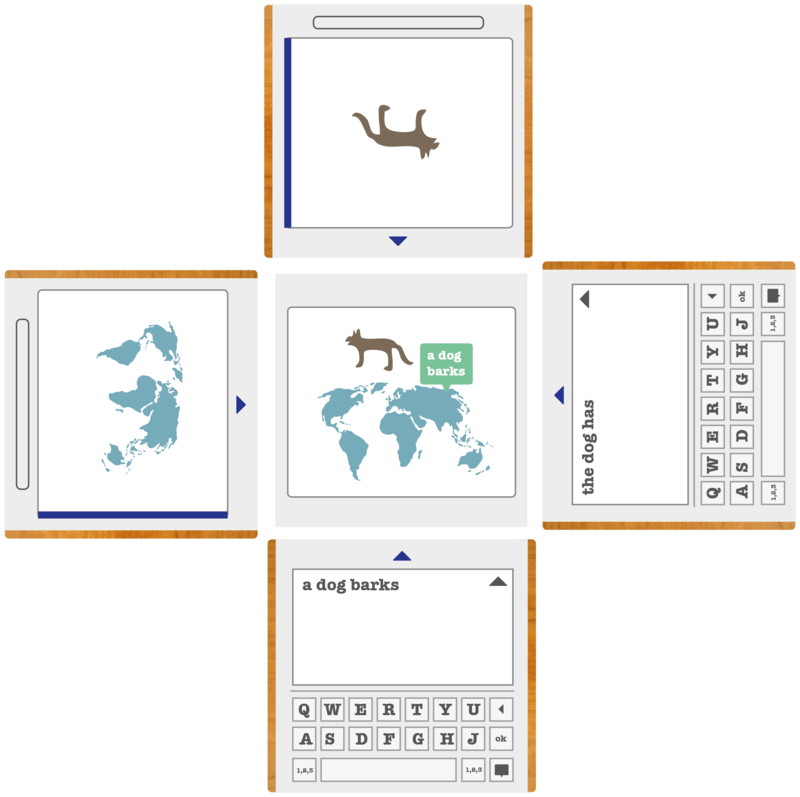 Drawn pictures will be stored as transparent images, allowing students to wrap text around an image. The central device will include two touch screens (one on each side), connectors for the other devices and a camera. Tangible and audiovisual feedback is particularly considered here, for example, devices are connected by magnets and sharing content to the center is accompanied by a gentle audio-visual animation. Assembly of shared content is performed on an infinite canvas. Paragraphs and images can be grouped to represent presentation collections, which may be saved to the cloud. For online research, students will have to deliberately agree on pausing their assembling tasks and turn the central device to access the browser. 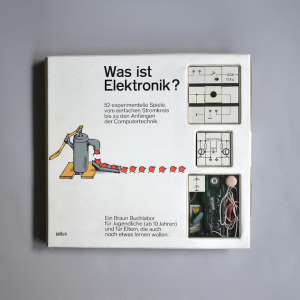 Design inspiration: The Braun “Was ist Elektronik?” construction kit. Overall, the Square1 collection moves away from personal computing, towards an understanding of shared and collaborative ownership. Simplicity and tangibility are guiding design principles of Square1. The idea for the devices was born while Teemu Leinonen explored different modes of computational interaction with children. The children frequently mentioned their enjoyment of tactile and multimodal feedback. Through further conceptualization of the comments by the children, we developed the hypothesis that school work, unlike professional work, should not be facilitated by efficiency devices, but rather promote a particular clumsiness of interaction. This also implies a consideration of certain slowness of learning carried through the principally considered affordances of the digital and computational devices. This builds on Lars Hallnäs and Johan Redstöm (2001) notion of slow technology, in which the inner workings of a tool are openly exposed, can easily be explored, and deliberately afford reflection. The inner workings of Square1 devices are discovered through construction. By design, the Square1 device collection is conceptualized to be assembled by students and teachers in school. Through collaborative design sessions with teachers, and various school visits, it became apparent that many modern schools have access to, or own, complex manufacturing machinery, including laser cutters, milling machines and 3-D printers. Students are trained to master the tools, and teachers report the empowerment students experience by using the machines, first, under guidance and, later, independently. Frequently, however, students are instructed to create novelty products that are discarded shortly after creation. The design of Square1 is building on the idea that access to manufacturing facilities is possible for many more schools, also due to the proliferation of Fabrication Laboratories (Fab Labs), an open hardware initiative by the Massachusetts Institute of Technology (MIT) Center for Bits and Atoms and Grassroots Innovation Group. Square1 is not a functional prototype yet. The first industrial non-functional prototype of Square1 will be available in April 2013, and will be presented at the Interaktiivinen Tekniikka Koulutuksessa (ITK2013) in Hämäänlinna. This entry was posted in Prototypes and tagged dedicated, learning, learning device, prototype, school, single-task, Square1. Bookmark the permalink.